For the most part The Bean is a pretty good independent player, but she has something against playing independently while I am cooking. I am not sure what the reason is but she always chooses the minutes while I cam trying to get dinner together to attach herself to my leg. So I am always on the hunt for something she can do in the kitchen that will give me a little time to make dinner, but still allow her to be close by. A few months ago I shared a post about sorting spoons, which has greatly improved the quality of dinner at our house. So when I saw this idea from The Imagination Tree, I thought it might be a good one for our pre-dinner repertoire. 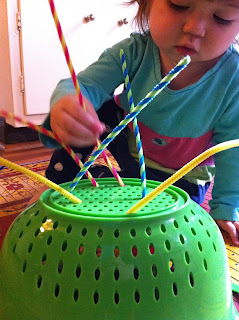 I recently bought some pipe cleaners from the $1 section at target, and I used one of the colanders we already owned. I gave no explanation just put the stuff on the floor and she dove right in. She was very focused on getting the pipe cleaners into the hole. When she had gotten them all in she carefully took them out and started again. This was a great exercise for her fine motor skills and we had a delicious dinner!